However, it doesn't mean you have to spend that much to buy a new car. Whether you're in the market for a new-new car, or looking for a previously owned set of wheels that's at least new to you, there's always a way to save money. Here are some of my top cheapskate car-buying tips. That's tough-love advice, but there's a good reason for it. You might need to settle for a lesser model, opt for used instead of new or postpone your purchase to continue saving until you have the cash to buy.That's because when you pay interest on something that actively loses value, you are losing money in two directions. If you finance $25,000 for four years at 6.9 percent APR, you'll pay $3,680 in interest over the life of the car loan. When you consider that the average depreciation rate for new cars is 20 percent the first year and 15 percent after that, this same vehicle will lose another $13,734 in value over the life of the loan. Combined, the purchaser will lose $17,414 in four years on the deal. For those who can't or won't follow the above advice, at least get preapproved for a car loan before heading to a dealer. This will allow you to compare dealer interest rates to other available auto loan rates. It will also aid in you being able to focus on the sales price during negotiations rather than the monthly payment. Furthermore, don't take out an auto loan for more than 48 months. The longer the term of the loan, the worse the borrower tends to perform on paying it back, according to a recent Fitch Ratings report about auto loans. Also, many personal finance gurus -- including yours truly -- advise that your monthly car payments shouldn't exceed 15 percent of your monthly take-home pay, and that assumes that you're not already overburdened with credit card and other consumer debt. Yep, more tough love advice. To paraphrase Elvis, "Only fools rush in... to a car dealership before doing their homework." Before heading to the dealer, research and know the car models that fit your needs. The less picky you are, the more options you will have in finding a bargain. Don't limit yourself to only one make and model. Doing so can steer you head-on into a bad deal, as it puts you at a negotiating disadvantage, particularly if the car you want is in short supply. Choose the right car for you. Think of your everyday needs, not occasional wants. Example: If you only haul large items a couple of times a year, it might be more practical to rent a pickup truck when needed rather than drive a gas guzzler every single day. Once you've zeroed in on makes and models that interest you, take the time find out what other people are paying for similar vehicles. Websites like Kelley Blue Book, NADA and TrueCar allow you to determine value based on what other shoppers have actually paid for similar vehicles. "How much does that car cost?" is a much different question than "How much will it cost me to own that car?" There's a lot more to the equation than just the purchase price and any financing cost. The free online "True Cost to Own" tool on the Edmunds.com is an excellent way to get a clear picture of the total cost, including hidden costs, for the specific make and model you're considering. Depreciation, insurance, fuel, taxes, fees, maintenance and repair are among the costs factored into the equation. A test drive at a dealership can be a lot like a first date: It's brief, exciting and leaves you wanting more. (Well, at least like some first dates). If you're buying a new car, it's likely to be one of the bigger purchases of your lifetime, so it's a smart idea to consider renting a comparable model for a week just to make sure you're truly in love before you buy one of your own. Plus, rental car rates are pretty reasonable these pays, particularly on a weekly basis. Typically, end-of-the year sales are usually the best possible time to buy a new car, as dealers try to meet year-end goals and unload last year's models. You'll also find that cold weather means fewer shoppers walking the car lots, so any winter month in colder climates means you reap the benefit of low demand, according to financial services company and auto lender USAA. It's wise to do your car shopping early during the week and at the end of the month. You also have a better chance of finding a salesperson who is anxious to get the last sales necessary to meet end-of-the-month quotas, according to car-buying website Autotrader.com. Dealers need to turn over their inventory as quickly as possible to stay in business, so if a car has been sitting on the lot for too long, you can bet it's "Let's Make a Deal" time. You can often spot these cars from afar by looking for odd paint colors or dirt/dust in places car washes often miss, like under spoilers. Once you think you've found one, look inside the driver's door jamb and read the manufacture date of the vehicle. If it's more than three or four months old (for domestic vehicles, or longer for imports), the dealer will probably be very motivated to sell it, according to RealCarTips.com, a car-buying advice website. Another option for finding slow-to-sell vehicles is to search dealer ads at Cars.com or Autotrader.com and filter results by listing date. Believe it or not, you can buy a new car with a no hassle price through Costco, Sam's Club and BJ's Wholesale Club. They've already negotiated prices in advance, so this is particularly useful if you don't enjoy negotiating. You can find your vehicle online and make an appointment with a nearby participating dealership, where you can buy your new car for the prearranged price. Most options and upscale trim levels do not hold their value well when it comes time for resale, according to Autotrader. This is particularly true of tech options, which go out of date quickly and might require subscriptions. Chances are you won't really use most of those options anyway -- like wipers on the headlights. Also, avoid buying any non-factory options as well. Dealers like to tack add-ons to new vehicles as a quick way to pad their profits. Whether it's undercoating, fabric protectant, pinstriping or anything else -- even if you want it -- you can find it cheaper elsewhere. You can even buy an extended warranty elsewhere for less than the one the dealer is probably trying to sell you. Particularly if you're in the market for a dependable used car, look for one with a manual transmission. Fewer Americans even know how to drive a stick anymore, so with a decreasing market among drivers, you're likely to score a sweet deal on a used manual vehicle. Plus, when compared to their automatic transmission counterparts, manual transmission cars have traditionally been lower in price, they get at least marginally better gas mileage and they generally require fewer and less costly brake and transmission repairs. In fact, for my book "The Cheapskate Next Door," I calculated that you could save as much as $30,000 during the course of your driving lifetime just by only owning manual transmission vehicles. Big wheels with tiny tire sidewalls are all the rage these days. However, they'll cost you a pretty penny more on your new car, and larger, heavier wheels will cause fuel economy to suffer as well, according to Car and Driver. When it's time to replace the tires, it's likely that your replacement tires will be pricier, too. So, size does matter, and in this case smaller is the way to go. Many car buyers assume that the invoice price is the dealer's cost for the vehicle, therefore you need to offer more than that for the vehicle. Not true. 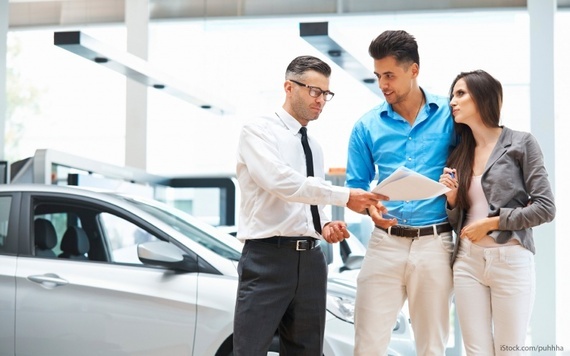 In some cases, dealerships are offered various additional incentives for selling certain vehicles that can still make it profitable for them to sell at or below invoice price, according to Autotrader. In fact, invoice price isn't even a true dealer cost number anymore, according to James Bragg in his book, "Letting the Cat Out of the Bag: How the Auto Industry "Redesigned" the Dealer Invoice Price When the Internet Arrived." So don't be put off by dealers who plead their case based on the invoice price. Also, always check for rebates that might be available from the manufacturer, since it's not the dealer's responsibility to notify you when you qualify for an incentive. Even if you're the rare type of person who loves negotiating for a new car, it's often best in the modern world to do so electronically. The reason is because dealership internet departments often quote lower prices than a traditional car salesperson, according to Edmunds.com. Negotiating by email also allows you to shop and compare with several different dealerships at once, while avoiding the high-pressure sales tactics you often get when you're sitting face-to-face in the dealership. Once you negotiate a price that you're satisfied with, take the quote to any other dealer and see if they will match it. If you do negotiate face-to-face, be nice to the salesperson. Complement him or her on their knowledge of cars, work ethic, etc. It might be their job to be nice to you, but if you treat them well in return, they're more likely to help you get a good deal. If asked, tell the dealer you are buying today. This makes it easier for them to justify offering their best discounts and spend time with you. If you're not buying today and they offer you a good deal, they know you might just take it to a different dealership. If possible, try to negotiate directly with a manager rather than a salesperson, since managers have the authority to actually wheel and deal. Treat the new vehicle purchase price and your trade-in as two separate negotiations. This doesn't mean you should lie and not tell the salesperson about the trade. Instead, by kindly asking to discuss the trade-in separately, it can help you avoid getting overwhelmed with numbers and dealer sales tactics. If your existing car is in good condition and has any significant value, trading in your car at the dealership will only get you a nominal portion of its potential value, according to car-buying website CarsDirect.com. With the benefits of today's internet sales tools, it's worth the time and hassle to sell your well-maintained used vehicle yourself. If negotiations turn sour, don't just threaten to leave the dealership -- actually do it. Car salesperson hear this threat a lot and don't give it much credence until you're out the door. "My mother-in-law (a retired widow) had a specific cash limit she wasn't willing to budge from for the purchase of a new vehicle," said professional personal finance blogger Alan Turner. "The sales manager would not agree to the amount she was willing to pay, so we left the dealership. Sixty minutes later, the salesperson texted and suddenly the dealership was willing to drop the price by $1,000 and agree to her price and take her trade-in." "We used our walk-away power to get the deal she could afford," he said. "Your best weapon in getting the best deal on a car purchase are your feet." Use your smartphone to verify market value and financing terms when you're negotiating. You're a lot less likely to hear false claims from the salesperson when they know Edmunds and Kelley Blue Book are instantly within your reach. "As a former car salesperson, our greatest fear was your smartphone," said Reddit user Salenth. "If we gave you a number and you had a smartphone in your hand with Autotrader or some other site pulled up, we were neutered." Most people buy cars directly off the lot, so it's unlikely that the vehicle you're looking at will have only those features you actually want. This can work to your advantage in getting some extras thrown in at a bargain price. It doesn't hurt to ask for smaller things, like a set of floor mats or an extra key fob, once you've negotiated the price. Try asking right before signing the papers, by saying something like, "I forgot to look, but that SUV comes with three keys, right?" Then when you're told there are only two, mention that the dealer whose price quote you're using told you they'd include three keys since you have a tendency to lose things. It's not uncommon to find mistakes with the math. That was the case when my friend and colleague Adam Lucas went car shopping with his bride-to-be. "When Jennifer bought a new car in 2007, I read through the numbers and found that with all the fancy math they attempt, they actually miscalculated the out-the-door price $2,500 in our favor," he said. "We noticed the error, but signed the paperwork. The next day when we showed up with our cashier's check, the accountant had caught the error and changed the numbers on our signed paperwork (essentially forging it) and the sales manager tried to force us into paying the price it showed on their new paperwork." "Luckily, we had our copy of the paperwork that showed the original numbers and were able to get the dealership to honor the original purchase amount," he said. "Unfortunately, I've read countless incidents online where these errors weren't in the purchaser's favor." This article, 20 Cheapskate Secrets to Buying a New Car, originally appeared on GOBankingRates.com.